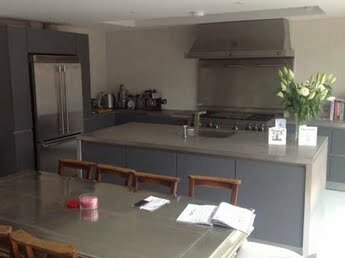 Hobbs & Porter manufacture bespoke stainless steel island units for domestic and commercial kitchens throught the UK. These can incorporate hob cutouts or integrated stainless steel sinks as required and can be made to any specified thickness required. 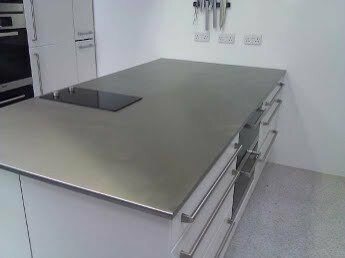 Stainless steel Island units can be made from 20mm to 100mm thick. Cut outs can be made to accommodate any aftermarket kitchen appliance - e.g. teppanyaki, hob, sink/drainer, griddle or pop-up sockets etc. Alternatively sink bowls and sink drainers can be welded in; a variety of options are available to suit your requirements. Taps are also available to purchase from us, again in various designs; please ask. Stainless steel island unit worktop 20mm thick showing induction hob set into cutout. Island unit worktop 40mm thick made of stainless steel showing integral welded sink and end panels. Location: London, England.